Maximum 10 songs are downloaded for you now, Be patient and enjoy! Daniela, Princess of Guca. The highs and lows of a Serbian trumpet band. Danijela Veselinovic was only eight years old when she first took a trumpet in her hands. She formed her first band a year later. She’s kept a tight grip on the instrument ever since. Now 22, Veselinovic is an accomplished professional musician who is finishing her musical studies at the Novi Sad Arts Academy. Only a year later, in February 2003, the young girl, her brothers, and a few relatives formed a band in their home town of Arilje in western Serbia. The band consisted of six musicians: five boys and a girl, aged six to 10. The band was called Danijela. “I was the only girl, so the orchestra was named after me,” Veselinovic says. Over the years, the unorthodox band has attracted more than a little media attention. Most recently, Serbia’s Vice made a film about the orchestra. “Disanje” (Breathing) brought them to the attention of a much wider audience. It was rare to see a girl playing trumpet when Veselinovic and her brothers formed Danijela. It’s still rare today. 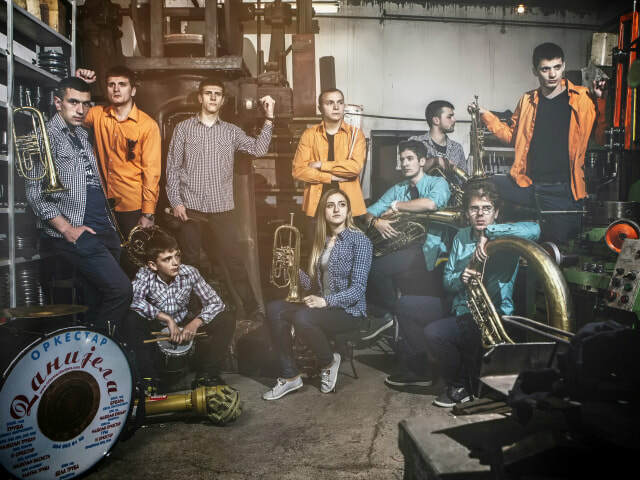 Veselinovic is the only woman in Serbia’s musical history to lead a brass orchestra. The band has participated at brass festivals not only in Serbia, but in Poland, Switzerland, Spain and Greece. In addition to the traditional Roma music played by other Serbian bands, Danijela plays brass versions of Serbian and foreign popular music. “Foreigners adore music from the Balkans,” Veselinovic says. Serbian brass bands perform at weddings, funerals and holiday celebrations throughout the country, but the centre of the trumpet universe is the Guca Trumpet Festival, held each August in a small western Serbia town, around 160 km from Belgrade. The Guca festival gathers music lovers from all over the world. The main attraction is the brass band competition, in which the best ensembles battle it out for the coveted Golden Trumpet award. During the seven-day festival, all you can hear in Guca is the sound of trumpet bands. Last year, festival organisers pledged to fine any shop or restaurant caught playing other kinds of music 300,000 dinars (around €2,500). Guca has always been something special for the young band. It’s where they first came to prominence and attracted the attention of Serbia’s musical community. “Guca is where we emerged,” Veselinovic says. Danijela competed at Guca from 2003 until 2014. The band won a prize at its very first appearance. Veselinovic remembers receiving the trophy from Boban Markovic, a Roma trumpet player who is deemed the greatest trumpeter ever to emerge from the Balkans. “You are a small trumpet princess,” he told her. Since that year, the band has won five additional awards at Guca competitions. Organizers say that since 1961, when the first brass fest took place in Guca, there has never been another female band leader. Veselinovic is especially proud of her place in the musical history of Serbia.Paragraph. Klik hier om te bewerken.